Aiseesoft Apple TV Video Converter for Mac is a versatile and easy to use Apple TV Video Converter for Mac. It can convert AVI, MP4, MOV, MKV, WMV, DivX, XviD, MPEG-1/2, 3GP, 3G2, VOB, etc. video formats to Apple TV MP4 video and MP3/AAC/M4A audio on Mac OS X with fastest speed and highest image quality. Aiseesoft Apple TV Video Converter also provides more parameters like bitrate, frame rate, resolution and audio channels to set for conversion. With Aiseesoft Apple TV Video Converter for Mac you can enjoy your video on Apple TV anytime you want. Aiseesoft Apple TV Video Converter for Mac can convert almost all the popular video format such as AVI, MP4, MOV, MKV, WMV, DivX, XviD, MPEG-1/2, 3GP, 3G2, VOB to Apple TV supported video MP4, H.264 formats. Aiseesoft Apple TV Video Converter for Mac can extract audio track from video file and convert them to MP3, AAC, AC3 and other audio files supported by Apple TV. 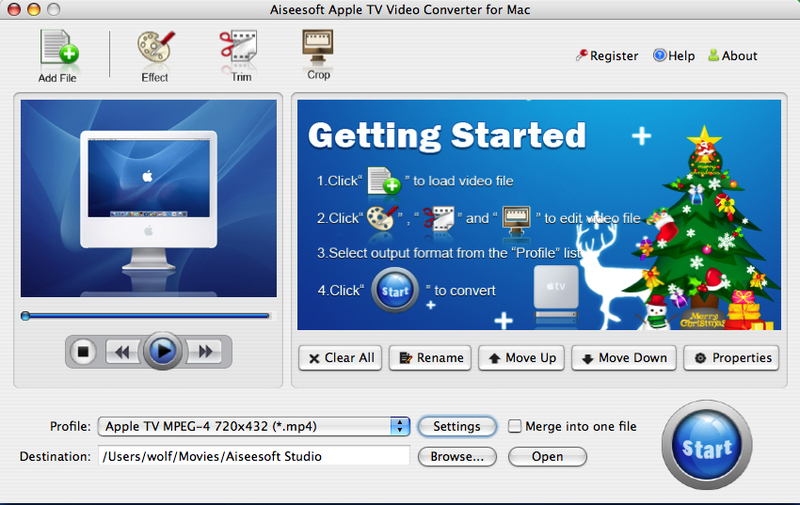 Aiseesoft Apple TV Video Converter for Mac provides various functions of video editing. You can trim any part of your video, crop your video and merge two or more videos into one file. Qweas is providing links to Aiseesoft Apple TV Converter for Mac 3.2.18 as a courtesy, and makes no representations regarding Aiseesoft Apple TV Converter for Mac or any other applications or any information related thereto. Any questions, complaints or claims regarding this application Aiseesoft Apple TV Converter for Mac 3.2.18 must be directed to the appropriate software vendor. You may click the publisher link of Aiseesoft Apple TV Converter for Mac on the top of this page to get more details about the vendor.